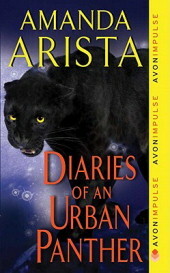 Sometimes it’s easy to read a book and say whether it’s an Urban Fantasy or a Paranormal Romance. Other times, the lines are more hazy. And it while it’s not essential to place every book in a neat little box, expectations can play a really big part in whether or not I enjoy something. I read a couple of complaints that this book was too UF, so I went in with the mindset that this wasn’t going to be a romance –and any lovin’ would just be a bonus. The story centers on Violet, an awkward and unassuming horror script writer, who is trying to start her life over in Dallas. She’s recently left a bad relationship, and the closest thing to family she has, is her best friend Jessa. But her boring life is turned on its ear when she is attacked by an animal. The handsome guy who has been “stalking” Jessa, is there in the aftermath to help her heal. And it quickly becomes apparent that the animal was a shapeshifter. “Stalker boy” (whose real name is Chaz) knows a lot about the supernatural world. He’s been tasked with helping Violet cope with her changes and realize her potential. I like the premise well enough, but as the story progresses, more and more events are revealed to be fated. I’m not a big fan of pre-destination. It makes me question free-will and ask why we’re all bothering to struggle if the end is already determined. (OK… let me get off my exsistential soap-box.) It seems like Vi was always going to be a panther. It was determined long before she was infected. And suddenly, people in her life are a part of the supernatural world. And it’s all a little too convenient. I did enjoy watching Vi come into her power. Of course, it was less about physical strength and more about empowerment in general. And while I wouldn’t necessarily call the book a romance, I did enjoy the tension between Violet & Chaz. Admittedly, it took a long time for the two of them to stop dancing around their attraction. I understood why Violet, who has spent a lifetime as a dumpy wallflower, had a hard time allowing herself to acknowledge her feelings for a guy as mind-blowingly handsome as Chaz. But I question his continued reticence. I know the reason we were given… it just didn’t work for me that sometimes he was ok with her panther and other times it sent him running for the hills. I also must mention that we had a smattering of typos in the version I read. But I acknowledge that I was reading an uncorrected proof, and hopefully they will be cleaned up for the finished product. Overall, it was a fairly good read for me. I liked Vi’s “voice”… her sarcasm and sense of humor. And her evolution (both physical and emotional) was fun to watch. 3 1/2 stars. Great review – I agree with a lot of what you said. I liked it enough to read another, if she continues it on as a series.